Yes, I am here with my giveaway announcement!!! 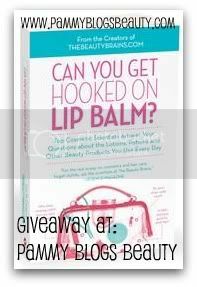 Three (3) winners will receive a copy of the book Can You Get Hooked on Lipbalm? by the creators of thebeautybrains.com. About the Book: "Top Cosmetic Scientists Answer Your Questions about the Lotions, Potions and Other Beauty Products You Use Every Day. Based on the blog at TheBeautyBrains.com, this informative book cuts through the confusing, misleading, and sometimes false information that beauty companies bombard consumers with and provides scientific answers to hundreds of questions about cosmetics." For giveaway rules and entry form, please keep reading after the jump! You must follow my blog: This giveaway is open to all of my readers who reside in the US or Canada only who follow my blog (be it through Facebook, Twitter, Bloglovin, Google Reader, Email subscription, or Google Friend Connect). Just make sure to tell me on the form how you follow me (as I will be double checking). So, fill out the Google docs form below to enter. You must include your name, email, and how you follow me (Twitter, Facebook, Google Friend Connect, etc). All the information entered into the form is viewable only by me. Please enter only one time (see below for additonal entries). You will get 1 additional entry for tweeting this giveaway. Please mention @pammyblogbeauty in your tweet with a link to this giveaway. You will get two additional enteries for either doing a blog post or a blog side-bar post of this giveaway (please make sure to provide a link to this post with a photo). Blogs that exist only to post giveaways links will be disqualified. Three (3) winners will be chosen by me through a randomizer like random.org. I will announce the winners by April 7th! The winners have 48 hours to respond to my blog announcement and/or email or another winner will be chosen. Love and Hugs to all my readers!!!! @Rizzie-I know, I am so sorry! Harlequin is mailing out the copies directly and will only ship out to US or Canada (they confirmed those details right before I posted the giveaway).